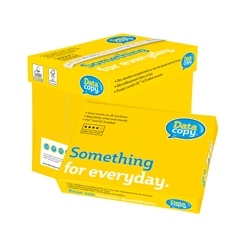 Data Copy 90gsm paper is the perfect office paper! You can throw whatever you like at it. Inkjet, laser, colour, black-and-white. It will just keep on performing in any job, in any machine, day in, day out. Data Copy is a total-office-guaranteed paper with an ultra white (CIE 170) smooth surface providing the perfect printing results for all of your daily communications. The higher thickness of Data Copy 90gsm paper makes it the perfect choice for external presentations, colour documents and double sided printing. A versatile premium white paper, Data Copy is ideal for text and graphics and for use in all office equipment. It has a reputation for outstanding runnability and as such is ideal for double sided high volume printing and copying. Made to the ColorLok Technology standard, Data Copy delivers a 50% improvement in colour vividness, brilliance and density, better printing contrasts, up to 36% faster drying time and up to 92% less print or show through. Combined with its beautifully white and smooth finish this in turn delivers amazing colour coverage for graphics and images. All standard boxes come with a comfy grab-and-go handle for easy carrying and a perforated side panel for ease of removal of all reams. Suitable for black and white copier, black and white inkjet, black and white laser, colour copier, colour inkjet, colour laser, high volume copier and duplex printing. Produced using FSC accredited pulp from well-managed forests independently certified according to the rules of the Forest Stewardship Council. EU Ecolabel. ISO 9706. ISO 14001. ECF.